The best way to explore the château today is to let your curiosity guide you. Allow yourself to be drawn by a particular smell or sound, or simply pass from room to room by opening a few doors... and discover the collection of contemporary art! The château of Oiron was built from the 16th century onwards by a family of powerful patrons, and was therefore always destined to be a sumptuous setting with spectacular décor, including a stunning gallery of painted murals in the School of Fontainebleau style, an exceptional collection of painted woodwork, sculptures and historical pieces from the 17th century. But that’s not all! 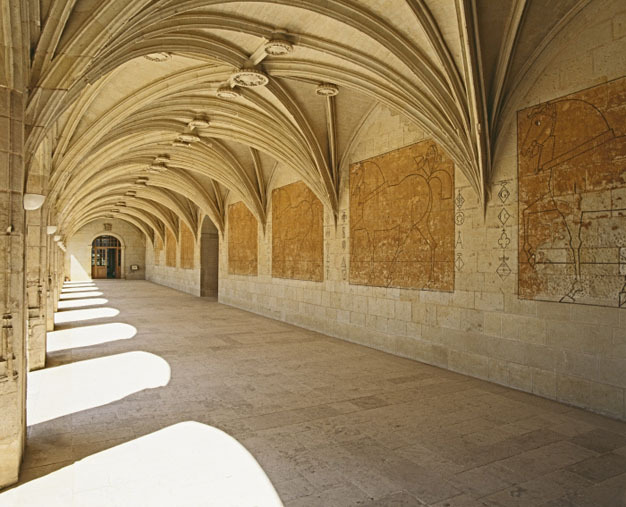 Since 1993, it has housed a collection of contemporary art not found anywhere else in France, known as “Curios & Mirabilia” (curiosities and marvels). This collection was created in memory to Claude Gouffier (the lord of the château), a major art collector. It covers the theme of Renaissance curiosities, with pieces that focus on people and nature. © Christian Boltanski - ADAGP - Caption: "Les Écoliers d'Oiron” portrait gallery, Christian Bolstanski. Public commission, CNAP collection, FNAC inventory. 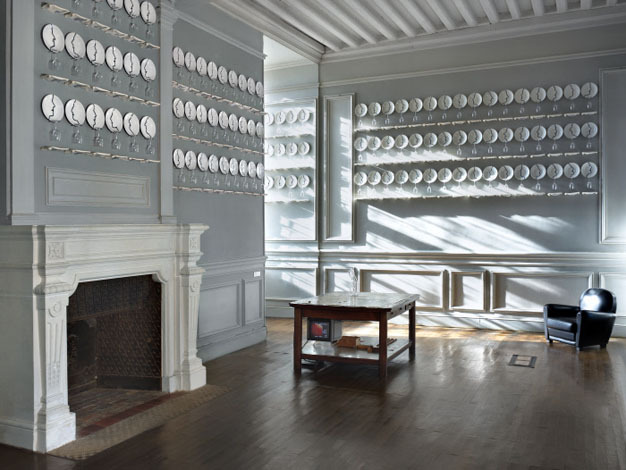 Christian Boltanski’s approach – replacing ancestors with descendants in the portrait gallery – is not simply a question of paradox. It reflects the replacement of selection by birth with equal opportunities under republican democracy – out with family lineage and in with demographic group. Children from Oiron school, now anonymous and ordinary-looking in their sweatshirts, are ready to make their own reputation in the future. Perhaps one day, that unassuming child (third from the right on the fourth row) will become famous for his or her exploits. In the meantime, all the children are aligned for the traditional school photo, ready for Boltanski’s shoot, covering the large part of the top picture rail. Just like individual children’s portraits, these photos are also sociological documents. They are snapshots of a moment in time, rather than illustrations. 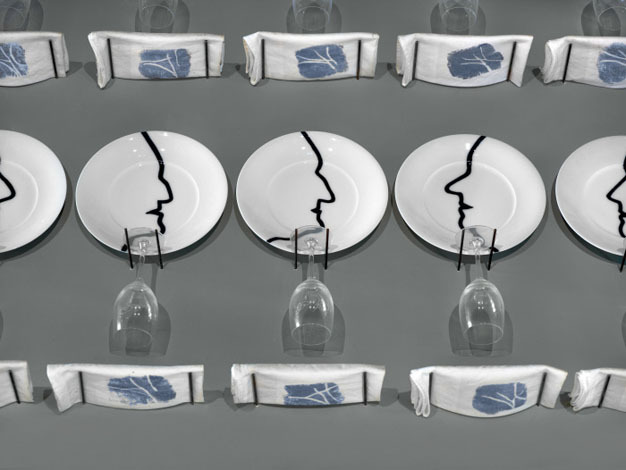 © Raoul Marek - ADAGP - Caption: The Dining Room, by artist Raoul Marek. Public commission, CNAP collection, FNAC inventory. © Georg Ettl - ADAGP - Caption: The Galerie des Chevaux, The Oiron Horses, by artist Georg Ettl. Public commission, CNAP collection, FNAC inventory. 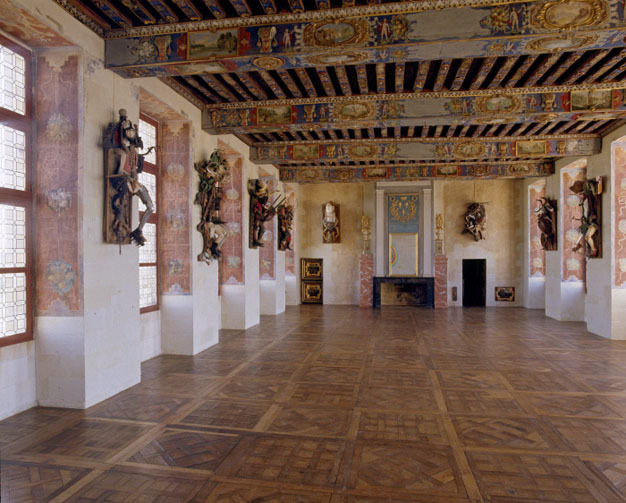 Georg Ettl’s frieze, which replaces the former paintings depicting some of the king’s finest horses and created in the 16th century, is a decorative interpretation of the same theme. For this particular piece, he used crushed charcoal applied with a brush to create the contours of the horses. The thickness reflects the thickness of the marks painted on the walls, designating the studs from Italy and Spain, which produced the very best chargers, identified with the iron branding mark on their flanks. © Daniel Spoerri - ADAGP - Caption: Salle d'Armes, Body Parts, by artist Daniel Spoerri. Public commission, CNAP collection, FNAC inventory. These trophies bear the mark of a man who has mastered the art of reusing waste and scrapped objects since 1960. The artist, who speaks several languages, creates combined pieces, inspired by his in-depth knowledge of the history of the objects he uses, and their relationship with language. These assemblies are images of the diversity of the world and reflect the concept of organised chaos. Each object has its own, mysterious history. The result is a macabre coming-together of the human and the natural – a recurring theme of Renaissance collections. The painstaking work of listing and categorising each item is a task matched only by the work of Rabelais. The artificial limbs and mannequins stand side-by-side with pieces of suits of armour, African ceremonial masks juxtapose gas masks, while wooden horses’ heads stand alongside real-life boars’ heads and young hippopotamus’ skulls. War is little more than the military arm of religion. The crucifixes recall the notion that the Wars of Religion, which gave rise to the Battle of Montcontour not far from here, are not simply part of a long-forgotten past. 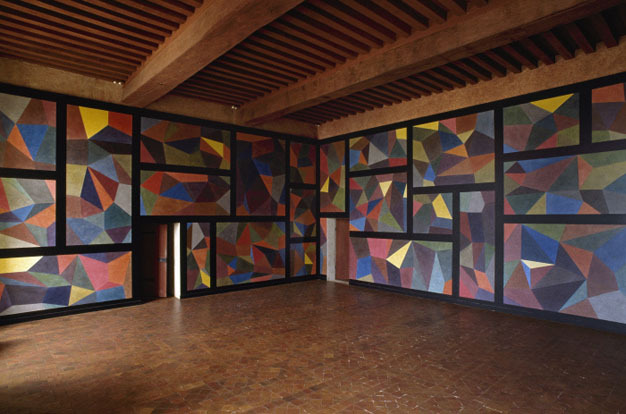 © Sol LeWitt - ADAGP - Caption: Salle des Figures Géométriques, "Wall drawing #752", by artist Sol LeWitt. Public commission, CNAP collection, FNAC inventory. The Salle des Figures Géométriques is entirely covered with a range of colour combinations, created through the application of successive layers of red, blue, yellow and grey ink, with no prior mixing. The resulting effect suggests a hidden mathematical structure. The shapes and colours appear to be infinite and endless, limited only by the boundaries of the architecture itself, i.e. the walls. Caption: Salle de la Lévitation, Decentre-Acentre, by artist Thomas Shannon. Public commission, CNAP collection, FNAC inventory. 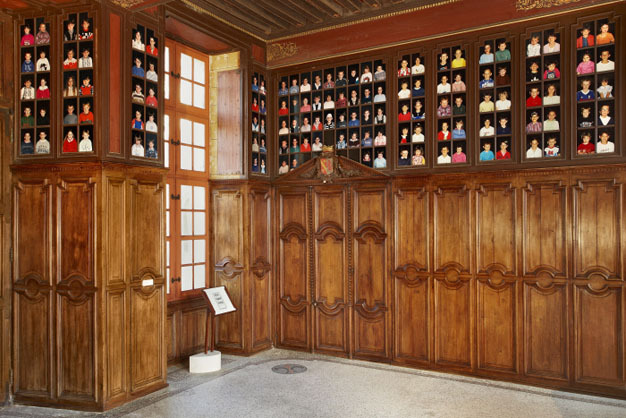 The Tour des Ondes, the first floor of which has most probably never been inhabited, is a place devoted to meditation and contemplation. The space is bathed in light by a pure aluminium disk, which looks perfectly in keeping with its environment. 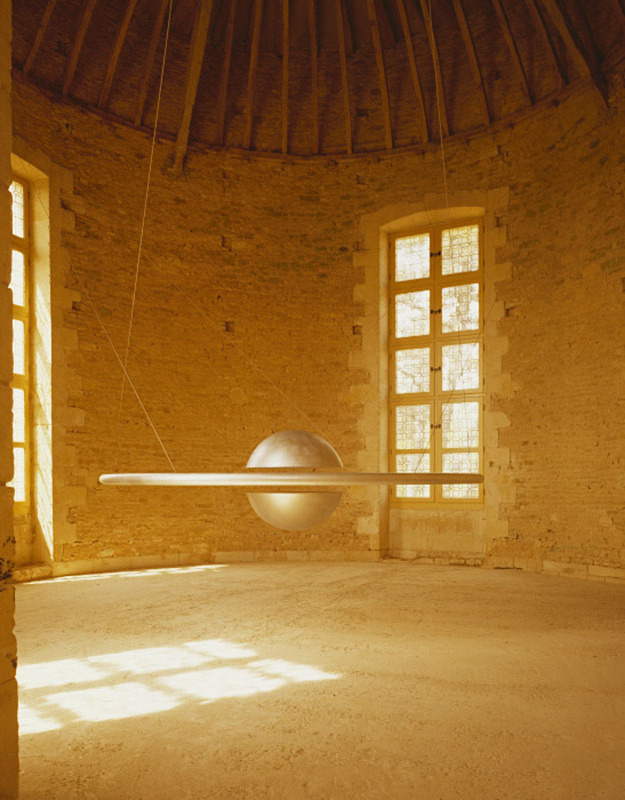 “Decentre-Acentre” is an allegory of the Earth and the cosmos, featuring a hemisphere above the vast disk, suspended via an inbuilt system of magnets, while its reverse double is hung. It is a place of great marvel and wonder, accentuated by aesthetic purity and the magic of the phenomenon. The floating hemisphere is held solely by an extremely fine cable, to counterbalance its lateral movement. Tom Shannon’s work reflects his passion for advanced technology and his awe for the spatial dimensions of our galaxy. The result is a world of weightlessness and paradise-like utopia.